Tenants of 83 and 85 Bowery poured into the streets of Chinatown yesterday afternoon to protest their landlord Joseph Betesh, again, who they say is a “slumlord” who has been harassing and trying to evict his tenants. Betesh, owner of Dr. Jay’s, bought 83 and 85 Bowery along with other buildings in 2013 for $62 million; according to a press release, tenants believe he has maintained that the building isn’t rent stabilized. Both parties have gone back and forth in court. In May of last year, Betesh’s lawyers agreed to work toward a settlement wherein Betesh would make repairs, relocate residents, and return them to their refurbished apartments with 99-year leases. However, tenants ultimately rejected the deal because Betesh would not agree that the units were rent-stabilized, according to one of the residents. 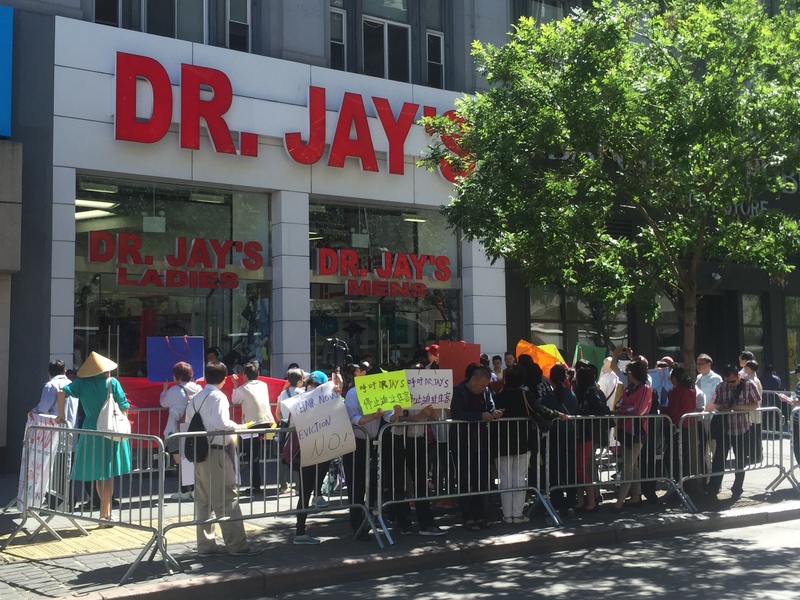 This morning shoppers looking for American flag swimsuits or bright-patterned leggings at Dr. Jay’s streetwear store in downtown Brooklyn were greeted by a flurry of slogans and posters decrying the brand’s owner, Joseph Betesh, as a slumlord. Tenants from 83 and 85 Bowery were gathered with local activists out front, chanting against Betesh’s efforts to evict them. Landlords are on notice–yesterday Steve Croman was charged with 20 felony counts and using illegal tactics to push tenants out of his buildings. Today Public Advocate Letitia James and Congresswoman Nydia Velazquez kept up the heat, using their clout to influence the outcome of a prominent tenant-landlord dispute in Chinatown. Standing outside the state supreme courthouse, the two railed against landlord Joseph Betesh (also owner of the Dr. Jays streetwear brand), accusing him of using “illegal practices” to evict 27 families at 83 and 85 Bowery. More than 100 Chinatown residents and their supporters crowded onto the sidewalk in front of 83 and 85 Bowery yesterday afternoon, marching around the block and gumming up traffic. 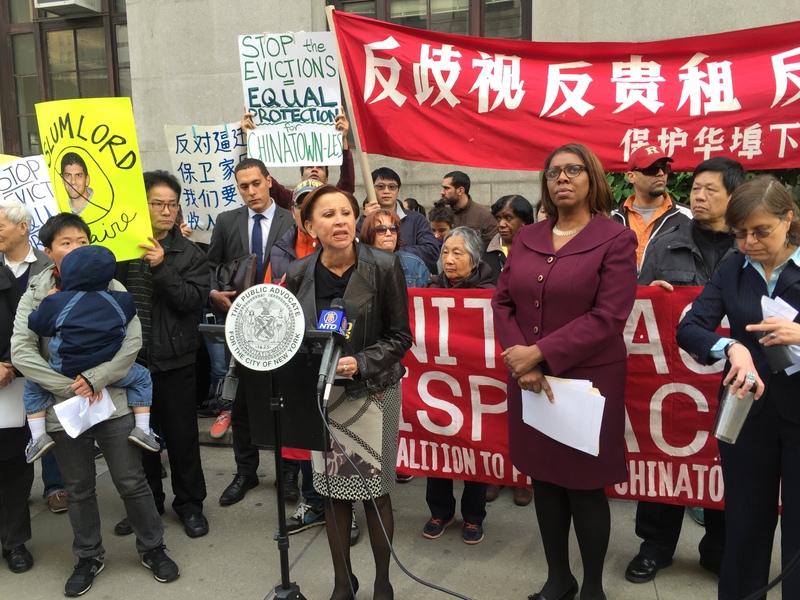 The rally was part of the Coalition to Protect Chinatown’s ongoing effort to draw attention to tenant harassment cases and push for height limits and rent stabilization in the neighborhood. About 100 people came out to the Bowery today for a press conference, where 27 families living in 83 and 85 Bowery spoke out against poor living conditions, according to David Tieu of The Coalition to Protect Chinatown and the Lower East Side. The tenants say the new owner, Joseph Betesh of Milestone Equities, has allowed the buildings to fall into disrepair and is refusing to renew their leases, and they plan to fight back to remain in their homes. A group of longtime residents of the Bowery will gather on the street in front of their homes Monday to officially announce their public fight against their landlord, who also owns nine other Bowery apartment buildings. A “couple dozen” tenants from adjacent numbers 83 and 85 have come forward to say they’ve been treated unfairly ever since the buildings were acquired by Joseph Betesh, according to Sarah Ahn, volunteer organizer for a tenants’ association that recently formed to address these issues.